Our Cuisine Regionale unites the Cuisines from the 15 regions of France. We seek to recreate dishes you could find in a family restaurant in our chef's home country . Homey, tasty, simple and healthy. We use only the freshest products in our kitchen. From onion soup and salade Nicoise, to quiche Lorraine and crepes Normandes, you'll get yourself a quick and delicious lunch. For dinner, try a hearty choucroute or a Cassoulet; or taste a skatefish or a classic hanger steak. Finish with a profiterolle or an apple tart or even chocolate mousse, Olivier's mother's own recipe. 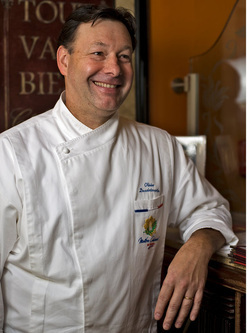 Olivier Desaintmartin, chef and owner of Caribou Café attended the hotel school in Paris, and has studied under world renowned chefs Michel Guerard, Jacques Chibois, Gaston Lenôtre and Le Coze. He is also a Champion on The Food Network's "Chopped." With Caribou, chef Desaintmartin wanted to make a departure from the world of the “white tablecloth.” A native of Champagne, France, he has focused on the hearty comfort food that he grew up with; that the French eat everyday. His recipes come from Provence, Gascony, Loire, Burgundy, Brittany, Paris, Lyon and more. Simple, but elegant and tasty dishes that are evocative of the home-kitchens across France. From Onion soup, Quiche and warm Frisee Salad to Cassoulet, Steak frites or Skate fish with capers, Olivier follows the seasons. You will find Steak tartare or Salade Niçoise in the summer, Boeuf Bourguignon, Duck Magret au Cassis, and Cassolette de Champignons in the winter. 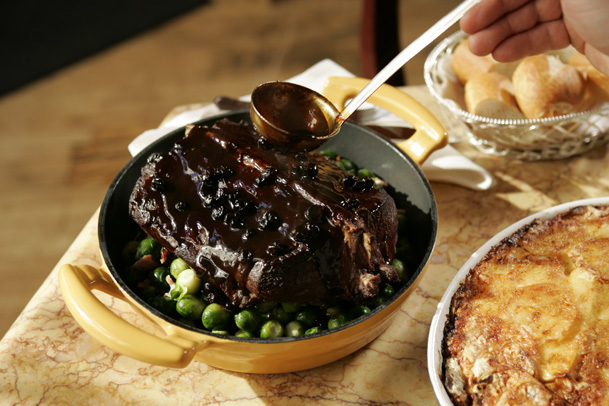 Olivier’s authentic French cuisine is the best value on Walnut Street.